Hong Kong is a place brimming with talented and intriguing people. In 27 Questions, we get up close and personal with notable Hong Kong personalities, learning about their whims, aversions, pivotal life moments, hopes and dreams — all revealed in roughly the same amount of time it takes to sit through a round of speed dating. This week, we had the pleasure of chatting to Ashley Yue — founder and operator of Hong Kong Food Crawlers. 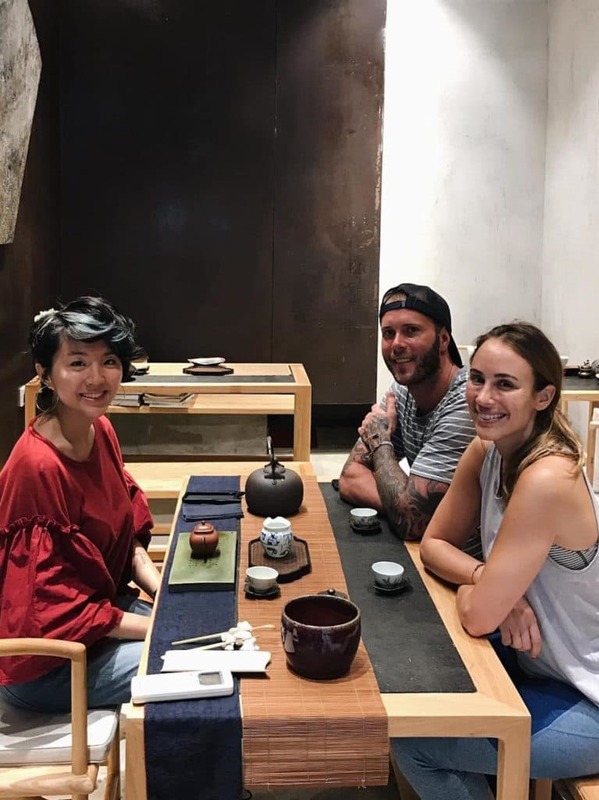 Inspired by the intrepid and heartfelt travelogues of journalists like the late Anthony Bourdain, Ashley returned to Hong Kong after five years abroad to start a food touring business which gives guests the inside track on classic Hongkie dining. From the best bo lo yau to the most unforgettable cart noodles, Ashley’s typical work day entails traversing a labyrinthine cityscape in pursuit of historic, inimitable, oft neglected culinary gems (adventurous tourists in tow). 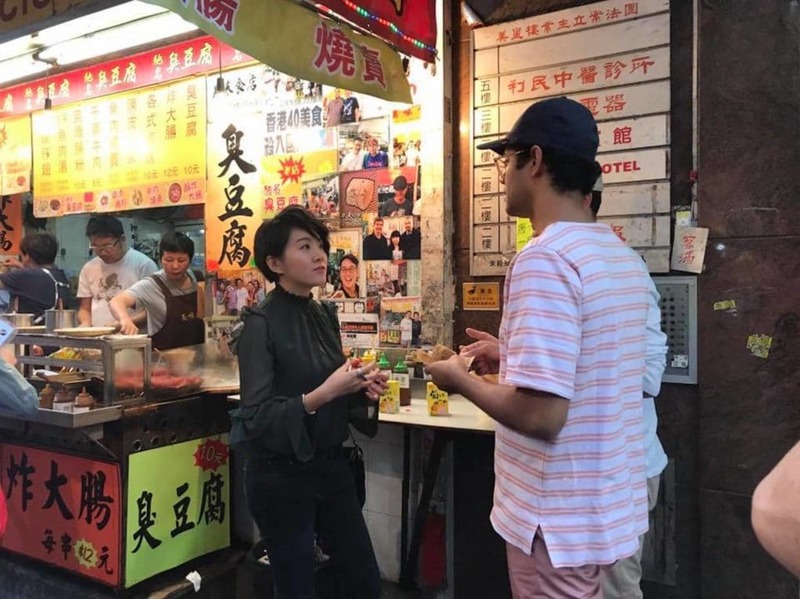 “I started offering guided food tours,” says Ashley, “primarily because I wanted to share my love of Hong Kong’s culinary culture with people from around the globe.” By any metric, she’s been quite productive. 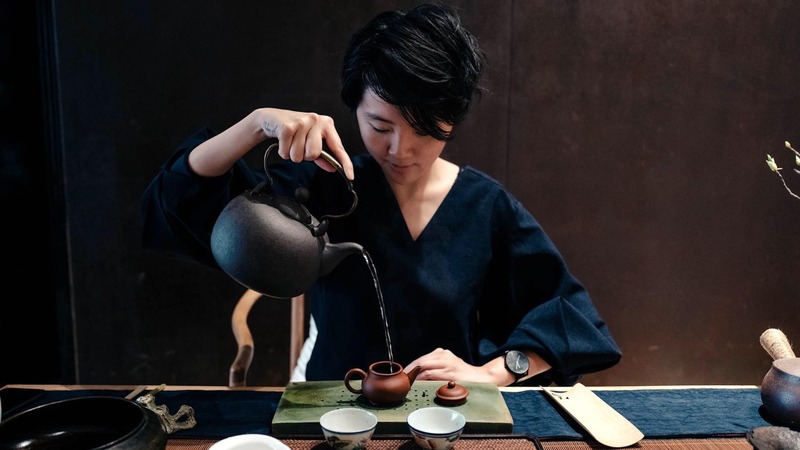 Since setting up shop in 2016, the 26-year old flâneur has been featured in a multitude of local publications that runs the gamut from South China Morning Post to Apple Daily. In 2017, a mere year after she began running food tours in earnest, Ashley was invited to appear on the British documentary series Travel Man alongside actors Jon Hamm and Richard Ayoade — yes, that Jon Hamm. On the subject of being involved in a large-scale travel documentary, Ashley is (as ever) relentlessly unfazed. “Filming television isn’t necessarily as glamorous as one would think. I was just glad I had the opportunity to show Western audiences a side of Hong Kong that’s informed by my perspective as a local,” she says. 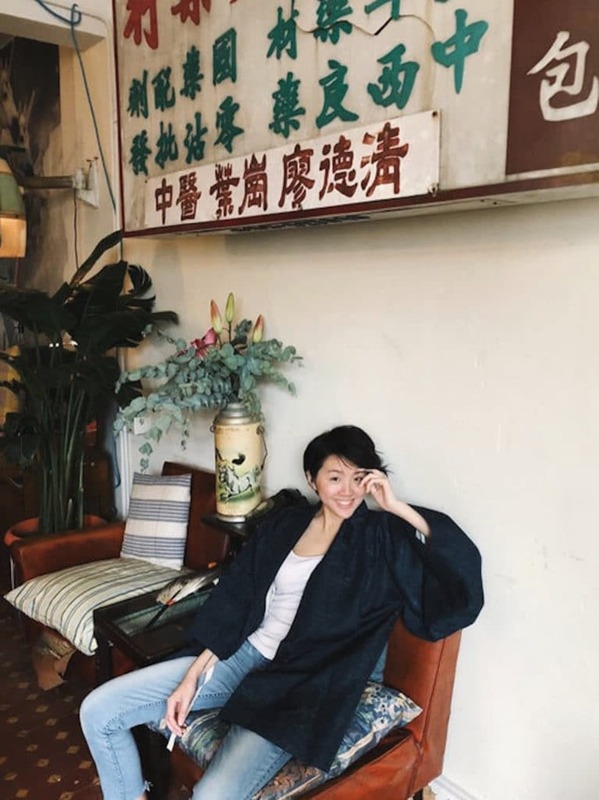 With that in mind, in this new instalment of 27 Questions, we sit down with this underrated foodie to find out (among other things) what makes someone a “real” Hongkonger and the surprising location of the city’s best steamed egg custard. 1. What is your life motto? As Yrsa Daley-Ward would say, “How do you get what you want? You design it”. I’m a firm believer in going after what you want in life instead of idly waiting for things to happen. 2. What is the best meal you've ever eaten in Hong Kong? It’s hard to pick a specific occasion but pretty much any of the meals I’ve had at home. My mum is an incredible cook who is constantly outdoing herself. I was a private English tutor for young kids and toddlers. A glass of red — Beaujolais or Brunello anytime. Pictured: Ashley in 2017 with Richard Ayoade (Travel Man, The IT Crowd). 5. When was the last time you drove a car? Believe it or not, I’ve actually never driven despite living abroad for so many years. It’s not something which I have the intention to learn — I’m far too clumsy! 6. What is the best thing in or about your apartment? My cats, especially Freddie (the Siamese I adopted when I was a student in Montreal). He waits for me by the door every night when I come home. 7. Which phone app can you not live without? WhatsApp. It helps me stay connected with family and friends. My mum’s steamed egg custard, showered with plenty of sweet soy and scallions. 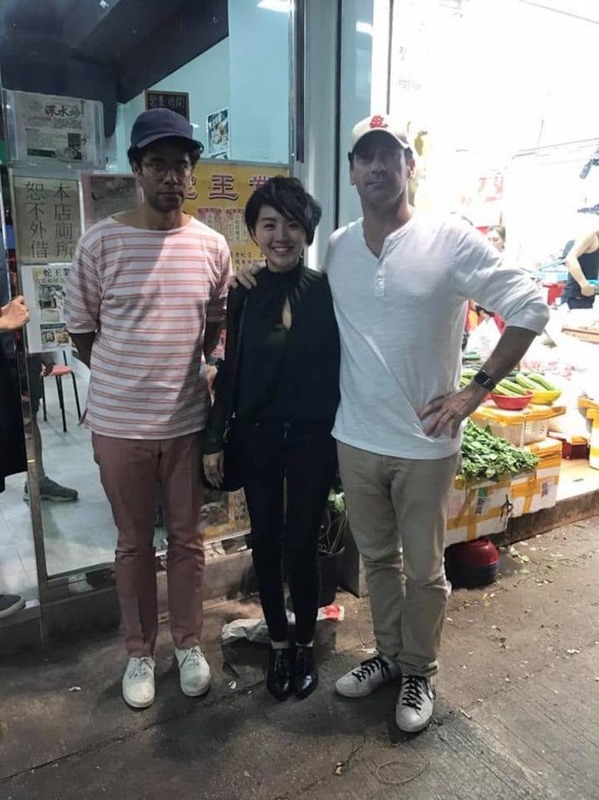 Pictured: Ashley (centre) on-location with Mad Men actor Jon Hamm (right) and a characteristically unsmiling Richard Ayoade (left). 9. What do you hate most about living in Hong Kong? The lack of space in the city. 10. What's the top destination on your bucket list? Morocco. My best friend Hind is from there! 11. What is your biggest guilty pleasure? Binging on Netflix all-day from the comfort of my bed. 12. What's one movie everyone should see? Ideally, I’d summer in Montreal and spend the remainder of the year in Spain. I never get tired of tapas and wine. 14. What makes someone a real HongKonger? Eating on the street, skewer in hand, like it’s nobody’s business. 15. If you could invite any five people in the world to your dream dinner party, who would they be? Roxane Gay, Sarah Kay and Yrsa Daley-Ward. These women are some of my favourite writers and have proved immensely inspirational. I’d also ask my best friends to join us too. 16. What is one song you know all the lyrics to? Calendar Girls by Stars. I even have the title of the song inked on the side of my hand. 17. If you could banish someone from Hong Kong forever, who would it be? Nobody. Banishment sounds rather harsh doesn’t it? Pictured: Ashley in the midst of shooting Painting the Town with Eric Dowdle (Season 3). 18. Where do you go when you want to be alone? My Central studio overlooking Tai Kwun. It’s just me and my books. 19. If you had to describe Hong Kong in one word, what would it be? 20. What's your favourite childhood memory? I remember being extremely sick and in the hospital at the age of four, when my dad brought me my favourite dorayaki. 21. What's one thing you've never revealed to your parents? I’d rather not say it out loud on the internet! Certified for their thoroughness and unbeatable insight, Ashley’s food tours have drawn no shortage of F&B industry insiders – like Mike Bagale, Executive Chef at Alinea (pictured right). 22. Are you a good cook? What is your best dish? Compared to my mum I’m nowhere as good — she’s an amazing cook! But my go-to is her signature version of braised oxtails with red wine. It’s always a hit. 23. Do you have a catchphrase? 24. Have you ever experienced love at first sight? Tell us about it? That happened only once and it was a while ago. I remember him walking into a café and as soon as our eyes locked I thought “oh there you are”. We’re no longer together but that’s a memory I’ll always cherish. 25. Do you have any favourite tattoos or special birthmarks? Tell us about them. I’ve got 7 inks, amongst which my favourite is the tarot card I have etched on my arm. It’s “The Fool”, the first card in the deck, representative of a free spirit who’s willing to take a leap into the unknown. The number “0” on top of the card refers to infinite possibilities. I laid my eyes on the inspiration for this particular tattoo at the beginning of the year, and knew immediately that I had to fly to Taipei to get it inked. So I did. 26. How many pairs of shoes do you currently own? Which do you wear the most often? Around 15 pairs perhaps? I wear my cherry red Doc Martens the most often — they’re just so versatile and can be matched with almost all of my outfits. 27. Would you rather never be alone for a single moment or be alone for the rest of your life? Why? I don’t think I could handle being alone for the rest of my life. I’m too much of a social butterfly — especially when you consider that my work requires me to meet travellers from all over the world on a daily basis! For more information about tour categories and pricing, visit Hong Kong Food Crawlers online. Alternatively, drop a line at info@hkfoodcrawlers.com for general inquiries.